, an eminent German astronomer, was born May 28, 1721, at Achleiten, a village in hither Austria, not far from Kremsmunster. He received the rudiments of his education in the convent of Kremsmunster, which was indebted to his uncle the abbot, Alexander Fixlmillner, for an excellent school and an observatory. Placidus conceived an early attachment to the mathematics, and took so much pleasure in delineating mathematical figures, that his mother, out of derision, called him the almanack-maker. After some stay at the above seminary he removed to Salzburg, where he completed his course of philosophy, and obtained in that | faculty the degree of doctor. His taste for the mathematics, however, became still stronger. 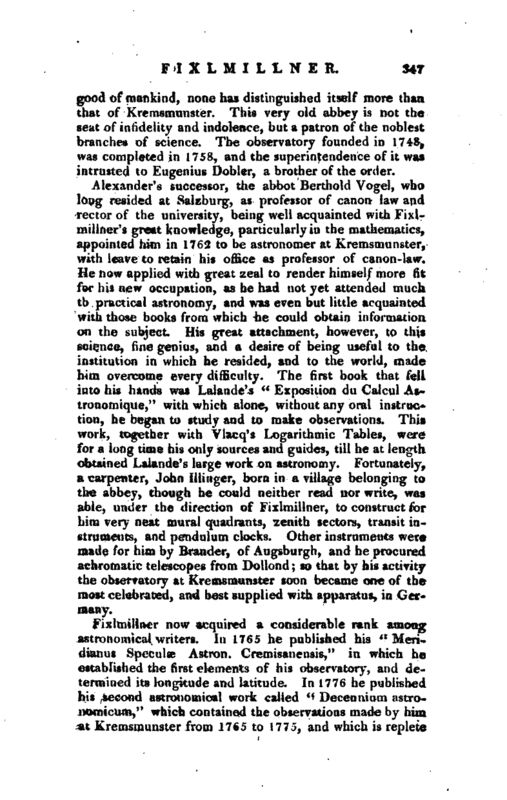 His father having asked him one da)' what present he should give him, he requested Wolff’s Epitome of the Mathematics; which he studied with the greatest pleasure and satisfaction during such hours as he could spare from his other avocations: but having destined himself for the convent, he was admitted a noviciate at Kremsmunster, in 1737, and next year he publicly took the vows before the abbot Alexander. After a stay of two years in the convent, he was sent again to Salzburg, to complete his studies in jurisprudence and theology; but at the same time he applied with great assiduity to the mathematics, languages, history, and antiquities. He learned also to play on the harpsichord and organ, and made so much progress in music, that he composed several pieces, both in the sacred and theatrical style. He disputed in some theological theses; and in 1745 returned to his convent, where he was consecrated to the priesthood. About this time the Ritterschule having been established at Kremsmunster, Placid us was appointed professor of canon-law; a department in which he had acquired great reputation at the university. This office he held for forty years, and resigned it only a short time before his death. Almost about the same period he was appointed dean of the higher school, and soon after principal regent over the young nobility; which places he retained also till his death. He possessed great knowledge of the canonlaws, and on that account was often employed in processes and other affairs relating to the convent. He was likewise inscribed Apostolical notary in the Roman court. In 1760 he published a theological work entitled “Reipublicae Sacrae Origines Divinse,” but he acquired far more celebrity by his astronomical labours, both as an observer and a writer. The abbot Alexander Fixlmillner, a great friend of the sciences, and particularly of the mathematics, having resolved in 1747 to form an establishment in his convent for promoting the latter, first set apart a spacious room for containing mathematical and philosophical instruments. This paved the way for something further; and he determined, for the improvement of his conventuals in astronomy, to erect an observatory. Among those convents which for a long time have devoted their leisure and riches to the advancement of science and the | good of mankind, none has distinguished itself more than that of Kremsmunster. This very old abbey is not the seat of infidelity and indolence, but a patron of the noblest branches of science. The observatory founded in 1748, was completed in 1758, and the superintendence of it was intrusted to Eugenius Dobler, a brother of the order. Alexander’s successor, the abbot Berthold Voge), who long resided at Salzburg, as professor of canon law and rector of the university, being well acquainted with Fixlmillner’s great knowledge, particularly in the mathematics, appointed him in 1762 to be astronomer at Kremsmunster, with leave to retain his office as professor of canon-law. 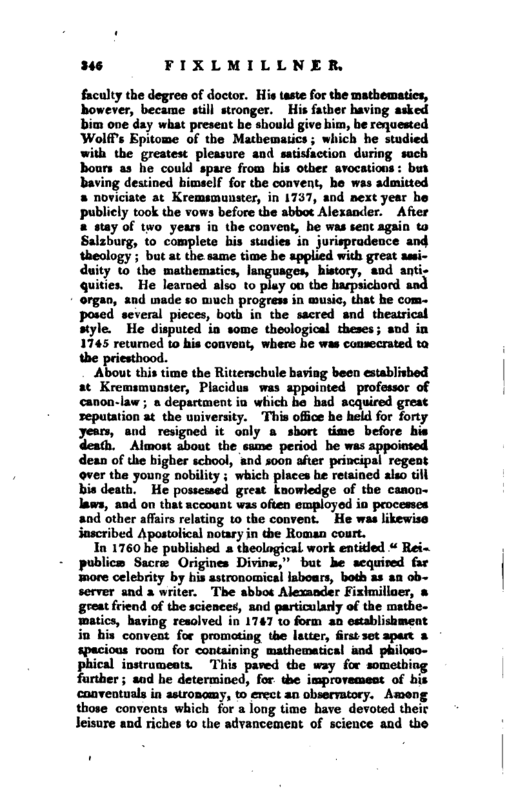 He now applied with great zeal to render himself more fit for his new occupation, as he had not yet attended much to practical astronomy, and was even but little acquainted with those books from which he could obtain information on the subject. His great attachment, however, to this science, fine genius, and a desire of being useful to the institution in which he resided, and to the world, made him overcome every difficulty. The first book that fell into his hands was Lalande’s “Exposition du Calctil Astronomique,” with which alone, without any ^oral instruction, he began to study and to make observations. This work, together with Ylacq’s Logarithmic Tables, were for a long time his only sources and guides, till he at length obtained Lalande’s large work on astronomy. Fortunately, a carpenter, John Illinger, born in a village belonging to the abbey, though he could neither read nor write, waa able, under the direction of Fixlmillner, to construct for him very neat mural quadrants, zenith sectors, transit instruments, and pendulum clocks. Other instruments were made for him by Brander, of Augsburgh, and he procured achromatic telescopes from Dollond; so that by his activity the observatory at Kremsmunster soon became one of the most celebrated, and best supplied with apparatus, in Germany. 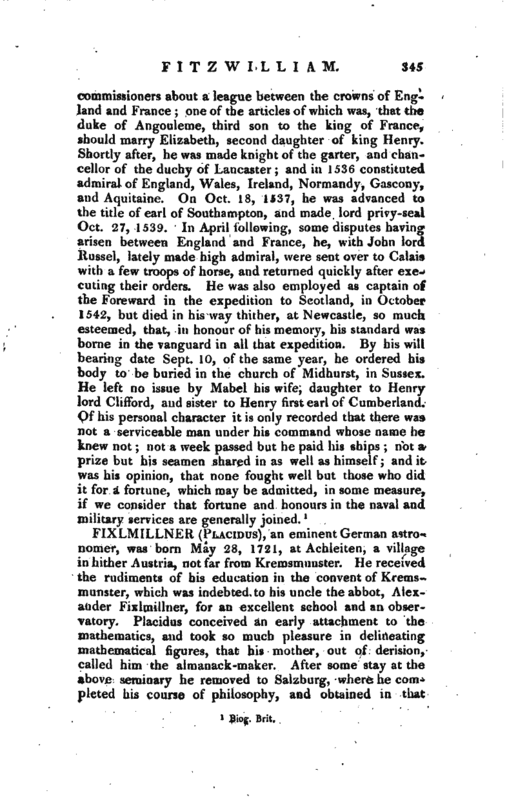 Fixlmillner now acquired a considerable rank among astronomical writers. In 1765 he published his “Meridianns Speculae Astron. Cremisanensis,” in which he established the first elements of his observatory, and determined its longitude and latitude. 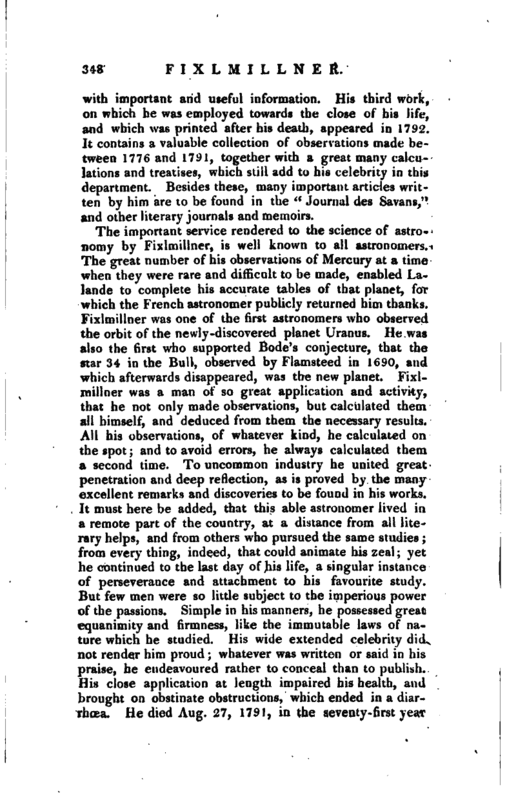 In 1776 he published his second astronomical work called “Decennium astronomicum,” which contained the observations made by him at Kremsmunster from 1765 to 1775, and which is replete | with important and useful information. His third work, on which he was employed towards the close of his life, and which was printed after his death, appeared in 1792. It contains a valuable collection of observations made between 1776 and 1791, together with a great many calculations and treatises, which still add to his celebrity in this department. 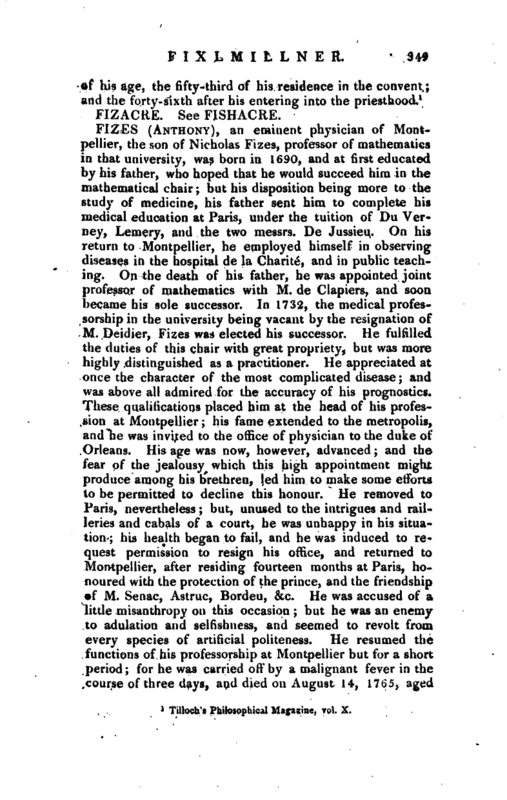 Besides these, many important articles written by him are to be found in the “Journal des Savans,” and other literary journals and memoirs.